As of last week the company I work for moved their headquarters and suddenly instead of a 5 minute commute I have a 45 minute commute. I'm finding that stolen hour and a half of each day is sadly eating into my hobby time - no more getting up an hour early in the morning and paint, it's get up an hour early just to get to work on time. Nevertheless, I did manage to get the Skitarii rangers up to the pre-transfers-and-weathering stage, marking the final unit that remained unpainted, and the goal line to indulge in some build time! While they'll all get some ad-mech waterslide transfers, I decided to leave the base troopers coats fairly bare and keep the cog-tooth pattern for the leader to help him stand out a bit. They still feel a little monochrome, but the green static grass should really help 'em pop once we get to that stage. Felt good to flip the colors over from yellow to green, now I get to reward myself with some build time - gonna finish up the two final units of infantry (the Vanguard and the Infiltrators), and do the Knight at the very end as a capstone to the army. Still on track for an end-of-August finish date! 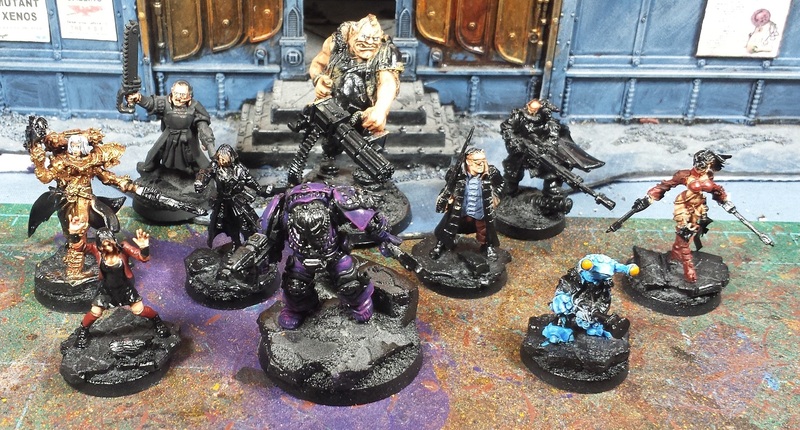 While I was poking around up in the hobby loft I pulled a selection of models from the "this would be a good Dark Heresy/Rogue Trader RPG model" shelf, with an eye towards painting up an Inquisitor warband. No real plan as yet, but I think it'll be fun to come up with some backstory for 'em, and it's a nice varied set of minis to dabble with when I need a brief breather from the army painting process - more to come on this little project in the future! Uggg...so sorry about that commute change. That is a Massive massive difference. Adds up sooo fast. I hope you get some sort of other compensation from the move! (like a swanking office or something). Models look great as always. At this point, just imagine me shooting praise out of a praise cannon...which suspiciously looks like a kitten cannon, but don't worry, it's praise. My first job was a ten minute walk from my house but then I got a job in Manchester and it was an hour on the train, which I've been doing for the last 17 years. I never once considered driving as I knew motorway traffic into Manchester was a nightmare and that was before I joined the company responsible for looking after them. So if you're driving in a feel for you but if you can get cheap alternative transport then consider it because although you won't get the lost hobby time back I find I can catch up on sleep and watch TV shows on my phone/tablet on the way home, or even read a book! Meanwhile love the variety in the bases, flat and chunky in places. Also that purple terminator is what I was going to use as Belial with Lightning Claws! OLD SKOOL! That Inquis warband is sweet! So many cool characterful minis. Only one I am not a fan of at all is the derpy looking IG-chainsword bloke at the back... Just doesn't fit in imo. My commute is an hour each way, so I feel your pain on that my man. I have been listening to gaming podcasts and drawing random marines on the train these days. I really must get around to getting some art up. Regarding the Rangers as ever you manage to tie them all in very nicely. You always manage to create a nice theme running through your units. But I am looking forward to seeing you challenge yourself to something crazy like Noise Marines with daemonic allies, a riot of colours. Likng the band you have going there. Looking forward to seeing them come together. Get them a tuarox to ride in. Also do you use something to do up your spreadsheets for painting or just throw it together in exccel? I could use one of them. @Greg Hess: The new office is pretty swank, and I have a killer view of the rocky mountains out the window just over my monitors so I can't complain about that! Thanks very much for all your kind words, man - I definitely appreciate 'em! @Dave Weston: Definitely taking advantage of the audiobooks, sadly the public transit system here is relatively poor, and unfortunately entirely unfeasible for the hours I'm working (having to be at work at 6am means nothing's running on the way in). I've had that old grey knight/inquisitor mashup knocking around in the Closet of Doom for nearly 30 years, figured it was about time I did something with it! @Rory Priest: Cheers man! The Inquisitor warband is going to be pretty colorful, looking forward to trying some interesting color combos! I just use an excel spreadshet for the painting charts/army lists. I'll shoot you a copy of one of the recent ones!